The lungs are paired organs that lie in the thoracic cavity. The lungs extract oxygen from inhaled air and transport the oxygen to the blood. 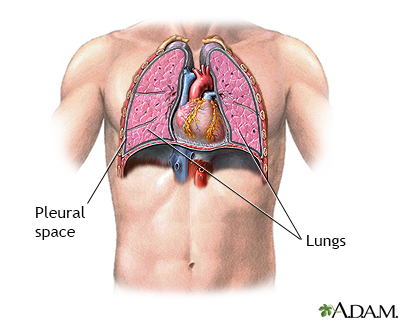 Surrounding the lungs is a very thin space called the pleural space. The pleural space is usually extremely thin, and filled with a small amount of fluid. If air enters the pleural space, the lung will collapse. 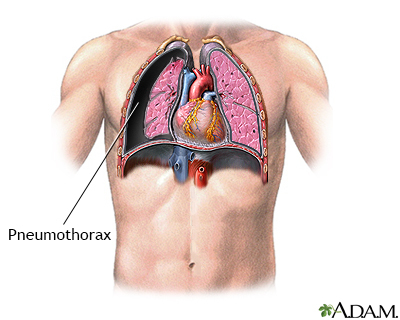 This is called a pneumothorax. If the chest wall is penetrated, which may occur as a result of an injury, air can enter the pleural space from the outside. Air can also enter from the inside, from the lung itself, if the lung is torn or ruptured. One of the most common causes of spontaneous non-traumatic pneumothorax is a pulmonary bleb. This is a weakness and out-pouching of the lung tissue, which can rupture. This introduces air into the pleural space. Pneumothorax can be life-threatening. 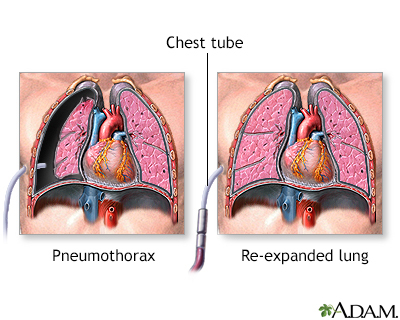 The immediate treatment for pneumothorax is tube thoracostomy, or the insertion of a chest tube. A long, flexible, hollow, narrow tube is inserted through the ribs into the pleural splace, and the tube is attached to a suction device. This allows the air to be evacuated from the pleural space, and allows the lung to re-expand. Chest tubes are generally inserted using local anesthesia. The chest tube is left in place until the lung leak seals on its own; this usually occurs within two to five days. Pulmonary blebs are a common cause of spontaneous pneumothorax in young children and adults. 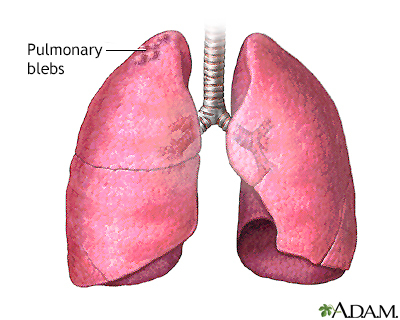 Blebs are weakened out-pouchings in the upper lung, which can rupture, causing pneumothorax. Pulmonary blebs can be resected, preventing future pneumothorax. 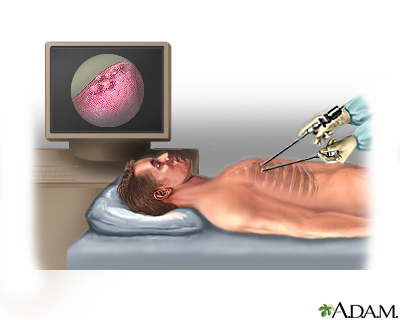 This is frequently done using a thoracoscopic surgical procedure. The patient is put to sleep using general anesthesia. Long, narrow instruments, including one with a camera on the end to allow for visualization of the interior of the thorax, are introduced through small incisions in the chest wall. 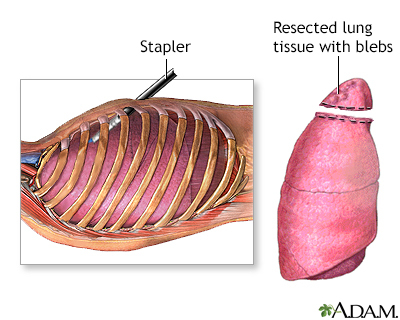 A stapling device is inserted into the chest during thoracoscopic surgery, and the segment of lung with blebs is stapled across and then removed. Most patients respond quite well to this procedure, and usually require one to three days in the hospital after surgery to recover. A chest tube is frequently left in place for one to two days after surgery to evacuate any residual air in the pleural space.